Amazonite is a beautiful green variety of microcline feldspar. Its chemical formula is KAlSi3O8 , potassium aluminum silicate. Feldspars can be alkali or they can be plagioclase. Amazonite is the pure potassium end member of the alkali group. It crystallizes at relatively low temperatures. At low crystallization temperatures the potassium feldspar, Amazonite, and the sodium feldspar, albite, separate into layers. This is seen as thin white bands of albite within the green crystal. One quality that makes this stone popular is schiller. Schiller is similar to iridescense. It comes from light reflecting off different planes within the crystal structure of the mineral. Light reflects differently in each of these minerals causing the effect of schiller. 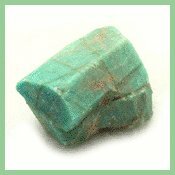 Amazonite is popular in jewelry and decorative objects as well as specimens for mineral collectors. It is usually light green to blue green and is found in granite and pegmatites. It has a range of 5 to 6 on the Mohs Scale. Large prismatic crystals are found in the Pike’s peak area of Colorado, the ILmen mountains of Russia, they can also be found in Madagascar, and Brazil. The specimens from Colorado are sometimes found with smoky quartz, orthoclase, and albite. When this is the case the value of the specimens is much higher. Mineral Properties Chemical formula: KAlSi3 O8 , potassium aluminum silicate. Crystal Habits: include blocky, or tabular crystals. Crystals are close to rectangular or square cross-section; Twinning is common. Cleavage: perfect in one and good in another direction forming nearly right angled prisms. Associated Minerals: quartz, muscovite and plagioclase feldspars. Location: Includes Pikes Peak region of Colorado in the USA; Russia; Brazil; and Madagascar. Some say the name comes from the Amazon River. This beautiful green stone has been found in Brazil but not close to the Amazon. This stone has been known and used by man for thousands of years. Long before the Spanish discovered this mighty river in 1541. In Greek Mythology the Amazons were a nation of women warriors. While there is disagreement over the historical existence of the Amazons as a people it is likely the source of the name of this stone. The name microcline can also be attributed to the Greeks. Mikron = little and klinein = stoop. Loosely translated we get “leaning a little”. Microcline cleaves at a slight inclination from 90 degrees. The ancients called amazonite the stone of courage. It has also been attributed with hope and confidence.